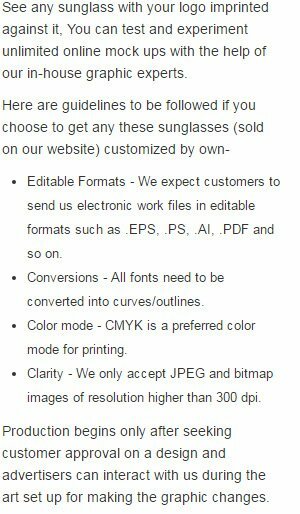 Custom Imprinted Solar Shade Shiny Sunglasses are excellent for outdoor promotions in bright sunny days. These custom sport sunglasses fit over most prescription eyewear, thus making it suitable for everyone. Gray lens and shiny Black frame are other highlights of these custom printed sunglasses. 100% UV protection feature makes them highly valuable for the users too. Made available in Blue, Red, Gray and Yellow color accents, there is also an imprint area of 1/2" W x 3/8" H in the temple which will display your brand logo exceptionally. Order today to get free custom design and free digital proofs facilities!